September 24th through October 1st is Banned Books Week. Over the years, many books and writers have been banned or challenged — for political reasons or just some vague feeling of “needing to protect the children”. Until this year, I’d never sought to read a banned book. 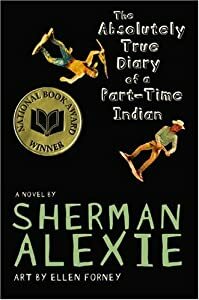 Then I decided I’d try and find one, and saw on the list of top ten challenged books for 2010 were two books I’d already read this week — The Hunger Games by Suzanne Collins and The Absolutely True Diary of a Part-Time Indian by Sherman Alexie. I’d picked these up because I’m on a bit of a YA bent right now, and because I’m a First Nations major who had the privilege of seeing Alexie speak at a conference several years ago. What’s amazing is the amount of YA novels that get banned or challenged. We feel that we must protect children and teenagers from darkness, danger, naughty words. The fact is most kids these days already live in hell, and as Sherman Alexie says, those dark, dark books give them weapons with which to fight for their lives. When I was 11 I was sneaking booze from my dad’s liquor cabinet. By the time I was 15 I had already tried to kill myself numerous times. When I was 18 and my mom sent me to get tested for diabetes (it runs in my family and I was showing symptoms), the doctor asked me what I would have done had I tested positive. “I’d probably just let it kill me,” I said, completely serious. He said he was going to recommend me to a therapist, and I said that was probably a good idea. Eventually I got onto anti-depressants, and then I got off them for a while, and continued in my deep spiral of depression. I was living in the States, under-age, and drinking a case of Smirnoff Twists every other night, taking pain pills along with it hoping to slip into a coma while I slept (I just woke up in the middle of the night with a headache and needing to piss like a racehorse). I would drive my car fast on dark, curvy roads, hoping to lose control at the right moment. I cut myself a lot and screamed out my anguish. Moving back home to Canada helped, but not much. It was legal for me to drink here, so my problem just intensified. I careened from one bad relationship to another and began to believe that I deserved the abuses they dealt out. In June of last year I decided I was tired of wanting to die all the time, and went to my doctor and said “I need help.” She put me on pills which balanced me and stopped my drinking habit. Three months later I met the love of my life, and finally realized that I deserved to be loved and cherished. I can now honestly say it’s been a year and four months since I thought about committing suicide, and even longer since I’ve attempted it (directly, at least — a year and a half ago I was still trying to drink myself to death). While I sometimes say, tongue-in-cheek, that life would be easier if I just offed myself — that is an example of dark wit in the face of crippling debt and chronic illness, self-hatred and despair. So, I’m sorry, but just where were these people who so desperately wanted to “protect” me when I was enduring the horrors** that led to this sort of depression? They want to ban books that may give me hope, because heavens forfend I read about kids overcoming insurmountable obstacles, about how friendship can get you through anything, about how it’s okay to be a smart girl, about a parent’s divorce not being the end of the world, about fighting off myriad enemies with only your wits and luck to guide you. Because life is worth living. I am so happy my suicide attempts all failed, because no matter how bad the economy is (I still haven’t paid all of September’s rent), no matter how dark things look — my life is better now. In ways I couldn’t have imagined when I was 11, 15, 18, even 23. Books gave me weapons. Many of the ones I read that helped me have been challenged enough times to make the list, because they’re “dangerous” for kids to read. The only thing that’s dangerous is for kids to stop reading. Had I stopped reading…well, I may not be here today. Reading gave me courage, hope, and the strength to see it through to the end. It’s not the end yet, and I’m not going anywhere. For Banned Books Week, pick up a YA book that’s been challenged. It shouldn’t be hard; they’re everywhere. See what’s so dangerous about giving kids hope. *If you want a chance to win a banned book this week, Jason Black at Plot to Punctuation is hosting a Banned Book giveaway — only thing required is a Twitter account. He also talks about why banning books is a bad idea, and one particularly famous example — The Adventures of Huckleberry Finn, by Mark Twain. **I have not gone into the actual horrors that shaped my adolescence. I have my reasons for this. Believe me when I say they were horrors.